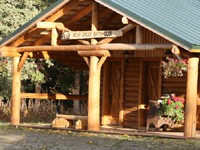 With its large over-hanging roof and deck, antique copper washer, rustic stalls and light fixtures, Bear Creek Bathhouse has been nominated for a feature article in a log building magazine. Besides the separate sides for men and women (handicap friendly), this new bathhouse also has a coin operated laundry and solar panels for heating. All guests have bathhouse privileges with access to coin operated laundry.